Held in Las Vegas, Nevada, from April 15-18, 2018, and in Lake Maggiore, Italy from May 13-16, 2018, BOARDVille allowed Customers, Partners, Analysts and Employees to interact, learn and draw inspiration from each other and spend time amongst those who drive the evolution of digital decision-making. The three day conference included intensive training, best practice sessions and sneak peaks of the newest product release, BOARD 11. Global leading organizations – such as Coca-Cola, PUMA, KPMG, Banco BPM and Groupe SEB – shared exclusive insights into top trends and challenges in the areas of strategic, financial and operational planning and analysis. Coca-Cola showed how it has implemented an integrated corporate planning solution with BOARD as part of its Supply Chain and Finance transformation strategy, based on three pillars: leaner finance, automated planning and optimized reporting. Coca-Cola uses BOARD to run Driver-Based Planning across 11 Countries and throughout several areas of the organization, from manufacturing and logistics to warehousing and delivery. In this way, Coca-Cola takes advantage of BOARD to connect finance teams with their operational business partners and close the gap between targets, forecasts and resource allocation. Puma – one of the world’s leading sport brands – presented the evolution of their planning process, highlighting how BOARD has enabled the company to move from a plethora of different, disparate planning and analysis tools to integrated demand planning and forecasting on the same decision-making platform. Groupe SEB – the world leader in Small Domestic Equipment which owns brands such as Rowenta, Moulinex, Lagostina and Tefal – explained why the Enterprise Performance Management system they implemented on the BOARD platform resembles their own purpose of making daily life simpler. SEB Groupe explained that the power and ergonomics of BOARD allow the business to increase flexibility and the provision of simulation capabilities have allowed it to progressively build up a finance toolbox made of smart and user-friendly apps. These, and other successful customer case studies presented during the event, confirmed why KPMG – the well-known global consulting Group – see BOARD as technological enabler for the integration of Enterprise Performance Management and Business Intelligence. At BOARDVille, KPMG once again recognized the value of BOARD in combining leading practices with enabling technology to address business challenges in the domain of analytics, planning and forecasting. 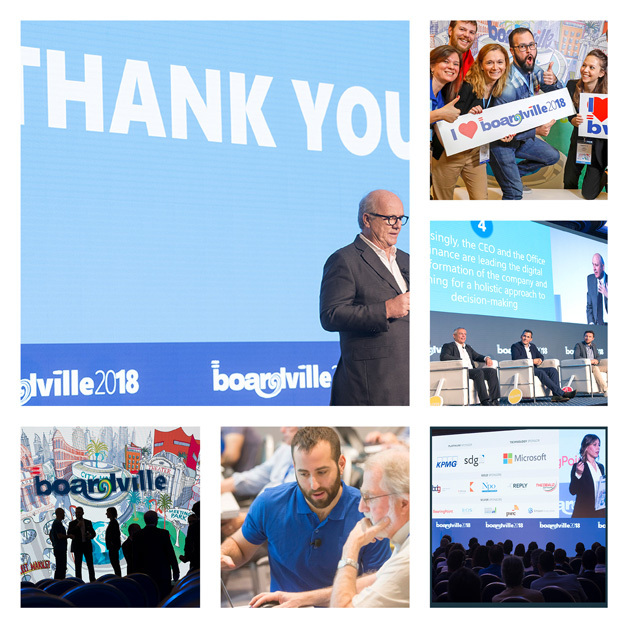 “The feedback we received from BOARDVille’s attendees were extremely positive and it again proved that BOARD is a point of reference for the world of decision-making in the digital era,” said Giovanni Grossi, CEO and Co-Founder of BOARD International. The increasing importance of the alliance between technology and human decision-making processes was masterfully shown by the greatest referee in soccer history, Pierluigi Collina, guest speaker at BOARDVille 2018. Thanks to his informative presentation, delegates discovered many similarities between the job of a referee and the jobs of senior managers in the world of business; in both cases, rapidly taking the right decision is key to the success of the game and technology and digital evolution are dramatically augmenting human decision-making capabilities. “We are already working on the next edition of BOARDVille which will provide more opportunities for valuable networking within the BOARD community, the sharing of ideas and best practice, and the opportunity to meet face-to-face with BOARD experts and partners,” concluded Mr. Grossi.